With its smaller size and portability, the EVH 5150III 50W 6L6 Head is the perfect amp for players who want arena volume and performance in a compact package. Three channels of road- tested sound work for any playing style - crisp cleans, raw crunch or searing leads, while newly added independent dual-concentric controls allows for gain and volume level matching. This 2.0 version of the popular 50-watt head delivers a full-spectrum of tone - channel one powers crystal-clear clean tone, channel two ranges from chunky overdrive to tight distortion, and channel three oozes with liquid gain. Channels one and two each have dual concentric gain/volume controls, with shared EQ (low, mid, high). Channel three has its own gain, volume and EQ (low, mid, high) controls. All three channels also have global presence and global resonance controls. 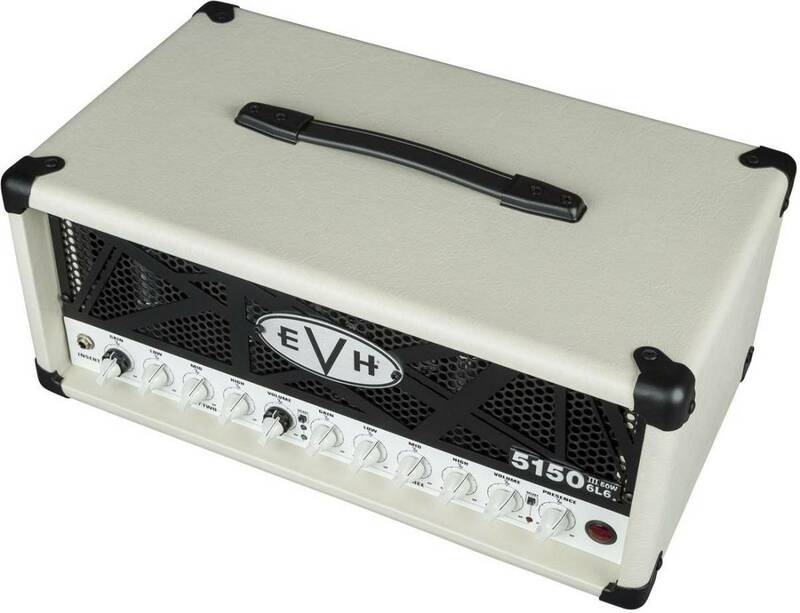 Loaded with pure EVH sound and power, the EVH 5150III 50W 6L6 Head is wrapped in Black or Ivory textured vinyl and features an instantly recognizable black EVH-striped steel grille. INCLUDED ACCESSORIES: 4-Button EVH 1/4" Footswitch. Ch1, CH2, CH3, Effects Loop. i cant get over the fantastic tone this thing has. all three channels are completely amazing. the cleans are well, very clean, and can get to borderline tubescreamer style overdrive just by turning the gain up. i bought this amp mostly for its main high gain channel, but boy am i having a fun time with the second blue channel. the second channel is an old school 5150 but with a modern voicing as well as more punch. it just shimmers. the third channel is really good and just chugs away, the thing sounds akin to bands such as gojira and all that remains, theres alot of metal in this amp head, its not just some old school amp head because its EVH. i cant say enough good things about this amp. the negatives are very small for me, such as it could have a more ergonomic control layout and maybe a built in low end boost or something. all the issues i have with it are super small. the amp though is fantastic and gets a solid 4.5 outta 5 for me, i enjoy this tone far more than any mesa product and thats quite the surprise. its not just an 80's era amp.